Ever wondered who this fellow is? I know I have. This is because I see his mug all over north Brooklyn. Read it for yourselves here. I encourage you all, gentle readers, to give ALL these videos (there are five total) a watch. They’re, um, interesting. As you know, I am strongly and proudly supporting Jo Anne Simon in her campaign to be our next City Councilmember.Â Jo Anne’s years of experience as an effective community leader, on issues ranging from affordable housing to accountable government, to truck traffic and parking reform, make her the best possible representative for us. I encourage each and every one of you who is interested in the 33rd District City Council race to attend this event. 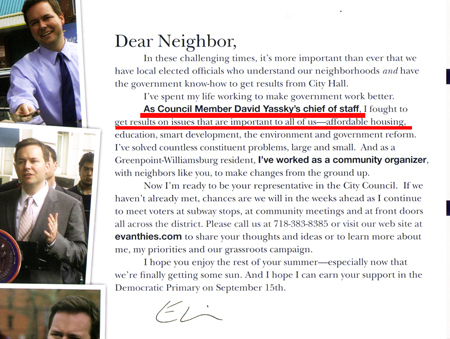 And, dear readers, you should be interested: whoever is elected to fill David Yassky’s vacant seat will have serious ramifications for north Brooklyn. Any and all interested in this opportunity to meet Jo Anne Simon (who, it should be noted, is the only female candidate in this packed race) can RSVP via email at: contact (at) joanneforcouncil (dot) com. Let’s give Ms. Simon a hearty Greenpoint welcome! August 5, 2009 starting at 7:00 p.m. Otherwise, those of you who cannot attend this “meet and greet” can learn more about Ms. Simon by clicking here. Under your watch, Evan, you have done nothing. Zero. Zilch. To preserve my community’s quality of life. Quite to the contrary; I live in a wasteland of derelict nondos, vacant lots and broken promises. “Smart development”: please explain to me why a bankrupt condo on my block is trying to rent one bedroom apartments for $2,150 a month? As a (now former) member of CB 1 (you resigned before that controversial vote on the Broadway Triangle thing— it’s harder to hit a moving target) I take it you voted in favor of this? Because what Greenpoint (which already has Bloomblight aplenty) needs is a 40 story tower. As long as it’s not in your backyard who cares? It’s in my backyard and I care. And of course there’s the matter of David Yassky, your mentor, funding the mural on India Street. With a little help from Dean Palin, the developer who wants to build said tower. 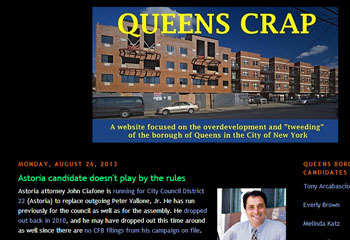 He and his donated in excess of $7,000 to Yassky’s Comptroller war chest. The head of the “Friends of India Street” group, Barbara McGlamery, donated no less than $300 to your campaign. Her husband, Adam “I never worked for a developer“* Perlmutter donated $175 to David Yassky’s campaign. Among others. Oh, but we get a “mural” and “park space” before this turd is built. With the tacit and enthusiastic approval of the head of OSAnb (who can be seen smiling with Yassky and Palin in the above image**) and NBpac: both are on the city’s payroll. Show me one piece of affordable housing in Greenpoint you have created, Evan, and I’ll give you my endorsement. You can’t and I won’t. I’m voting for Jo Anne Simon. P.S. : I will enjoy my summer knowing you, Yassky, and Rami Metal will be out of a job next year. With “progressive” representatives like you, who needs enemies? *Perlmutter did. He worked for George Klein. Who has hedged his bets campaign-wise. Here’s Klein’s vision of our waterfront.Â Boardwalk Empire is currently filming on Klein’s property: Commercial Street at Franklin. So much for enjoying our waterfront. **Which comes courtesy of the brave new Brooklyn Daily Eagle.